Here are articles on choosing the right leather jackets and bags for you. Shopping to get the perfect leather bag for that someone special (maybe you) this holiday season? Saddleback Leather sells the best. As a 25yr leather pro who has spent a bunch of time testing and researching Saddleback's leather finishes, I'm happy to share my knowledge so you (or a loved one) gets the best bag, in the right finish, for you this year. Saddleback comes in 4 finishes: Coffee brown, Chestnut, Tobacco Brown and Cobalt Black. While all Saddleback leather is chosen, tanned and finished to the highest quality standards, each of the 4 finishes has distinct properties. Depending on your lifestyle, these properties effect how each finish will wear and age for you. You need to care for, clean and protect each finish its own way for the leather to age well. Therefore, my goal is to lend my expertise to help you choose a finish that not only looks great but wears well and remains great as you use it over the next 100 years. To that end, this holiday shopping guide is meant to be a FAQ of all the leather information I have given Saddleback owners over the past few years. Each category below will cover the most common questions asked about choosing or caring for Saddleback leather with links to all the answers. The question is the link to the answer. So if you are interested in an answer to the question, just click it and you will go to the answer. I work in white collar setting and need my leather to look new, not beat up, for as long as possible. Which finish is right for me? I want my leather to take on a life of its own, to darken, scratch and look like ive taken it all over the world. which finish is right for me? I want low maintenance leather that I don't need to do much work and it will keep looking great. Which leather is right for me? How and how often do i clean my Saddleback bag? What cleaner is best for my Saddleback bag? What conditioner should I use for my bag? Do i need to protect my bag with a waterproofer as soon as I get it? What if i want a darker color or patina for my bag? I just got ink on my bag, what do i do? I had to store my bag and it got moldy, what can i do? I got caught in the rain carrying my bag, what can I do? Mud splashed up on my bag, what can i do? Somehow paint splattered on my bag, what can I do? Is Saddleback leather full grain or top grain or split and what is the difference? Can i have more details on the Saddleback leather mfg process? ... and Merry Christmas, happy holidays and have a great new year too. Patina is the sheen on any surface produced by age and use. Many different kinds of leather will patina. Darkening, shining and scratches are all common signs of leather patina. 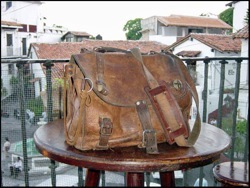 In this article I'd like to help you look ahead to how and why your leather bag may patina over the years you own it. The leather finishes i describe and bag photos shown have been provided by Saddleback Leather Company. Most people find leather patina cool. It's like the distressing of a bomber jacket or the breaking in of a fine leather chair. Because patina develops in response to your environment, it will make your leather bag a one of a kind. Others prefer their leather to look like the day they bought it for as long as possible. Part 1 of this artilce will teach you about which leathers will develop a patina and why. Part 2 will share some tips on how you can slow down, or speed up the process of your leather bag developing a patina. Part 1: How and why will different leather finishes develop a patina? Because leather can be finished in very different ways, the finishing process is the greatest factor in deciding the level and type of patina a bag will show. For this article I will discuss 4 leather finishes and how how patina effects each. They are finished leather, semi-aniline leather and two types of pull-up leathers. Finished leather will show very little patina over time. The sprayed on color and topcoat of finished leather protect the leather fibers beneath from absorbing liquids. The color and clearcoat also limit scratching and sheen changes to this leather. Effects of patina: If you like your leather bag to look like new as long as possible choose finished leather. Finished leather will patina very little over time. Shiny pull-up leather will patina some over time. The wax or oil that is applied, or "stuffed", into the leather provides some protection for the leather fibers from absorbing oil and other liquids. However, if a liquid sit on the surface of the leather for a long time it will absorb into the leather fibers. This may evaporate away or may stain the fibers darker depending on the type of liquid. Over time the surface can distress due to rubbing, scratches and fading. Once the surface wax or oil is gone the fibers are exposed and the leather will then absorb liquids and may darken. So, re-waxing this leather will slow the effects of patina. Effects of patina: If you'd like to be able to control some of the effects of patina on your leather bag, choose pull-up leather. Shiny pull-up leather will show medium levels of darker and lighter patina over time. Matte pull-up leather will also patina some over time. The same waxes and oils are stuffed into this leather to create a dark initial finish that will lighten significantly when stretched, scraped and scuffed. Because of the dark, matte finish on this leather, liquid spills will not show or create patina as quickly as the chestnut pull-up leather. Rubs and scrapes will show lighter distress areas on the leather. Effects of patina: Again, if you like some control over the effects of patina on your leather bag, choose pull-up leather. Dark matte pull-up leather will show medium levels of lighter patina over time. Semi-aniline and aniline leather will show the most patina of any leather finish over time. This leather is usually dyed to a color but then little or no finish is applied to the surface of the leather. Therefore, the fibers are exposed and will absorb liquids, change color with exposure the sun and lighten when scratched or scraped. The darkening and lightening that occur to this leather make it a great choice for those who like leather that becomes unique and distressed looking over time. Effects of patina: If you appreciate leather with a patina and want your bag to look distressed and unique, choose a semi-aniline leather. Semi-aniline leather will patina significantly over time in most cases. Part 2: How can you effect the patina of your leather bag? It is possible to control the level to which your leather will show a patina. Here are a few ways you can either slow down or speed up the development of patina on your leather bag. If you like patina you can speed it up. Do you want your leather bag to look darkened, distressed and uniquely yours very quickly? First, choose an aniline or pull-up leather which will naturally change easily. Second, apply a good leather conditioning oil to darken the fibers of your leather and give it a darker patina. Warming the leather with a hair dryer or in a warm oven will darken the bag even further. See the article Conditioning your leather bag to learn more about which conditioning oils you can use to change and protect your leather. Finally, use the bag lots. A well constructed leather bag, like from Saddleback, will withstand the rigors of daily use even as the leather itself develops a unique patina. If you like the look of new leather you can slow patina. If you prefer your leather bag to look like new longer, you can take steps to slow the development of patina. First, choose a more finish protected leather that will not absorb liquids or change easily. Also, you can spray or rub a clear protective coating onto your leather to keep soil and liquids from absorbing into the leather fibers. Finally, you should clean and condition the leather regularly so it is free from dirt and grime. Here is a video on the difference between top-grain and full-grain leather. Most furniture and some jackets and bags are made from top-grain leather but Saddleback Leather uses only full-grain leather. Here's a chance for you to see the difference. Check out their beautiful and durable bags by clicking here. Take $20 Off When You Spend $90 or more! "I'm excited to offer special deasl to my valued customers. Click on the link above. As always be sure to come back to www.leatherhelp.com with any questions you have about caring for your leather jacket, bag or accessories. " Here is an informative article from on of our affiliates, Wilson Leather. It is a good article to give you some insights into choosing different leather for your specific reasons. Versatile leather pieces are available in a variety of textures and finishes. Heavy and durable by nature, it's the leather-of- choice for motorcycle jackets, briefcases and belts. The latest techniques in tanning and finishing also are creating lightweight versions of leather that are popular for year-around wear. It's easy to care for, water- and dirt-resistant, and the perfect match for any lifestyle. Strong, yet lightweight leather is ideal for gloves and jackets. It responds beautifully to tanning techniques and color finishes, giving it wonderful dimension and rich hues. It's soft-to-the-touch, durable and a favorite among the world's top designers. Soft, smooth, and luxurious, lamb is the ultimate leather indulgence. It's lightweight nature and buttery texture give it a sophisticated appeal, which makes it the perfect choice for dressier jackets, sportswear and accessories. Although lamb is the most delicate of all leather types, it's also very wearable and transforms beautifully into today's most-fashion forward designs. Leather that is soft, durable and stain-resistant. It transforms easily into today's most current looks, making it a popular choice for leather jackets. New tanning techniques have created innovative surfacing like subtle sheens and matte finishes, in beautiful colors. This affordable, functional leather offers fashion, value and endless style. Suede refers to the underside of the leather, which is buffed to produce a velvety nap (texture). The natural highs and lows create interesting depth and beautiful hues, while the lightweight structure allows it to drape nicely - perfect for jackets, sportswear and handbags. Click on the logo to check out Wilson's great selection of leather jackets, bags and accessories. Knowing what kind of leather bag you own.